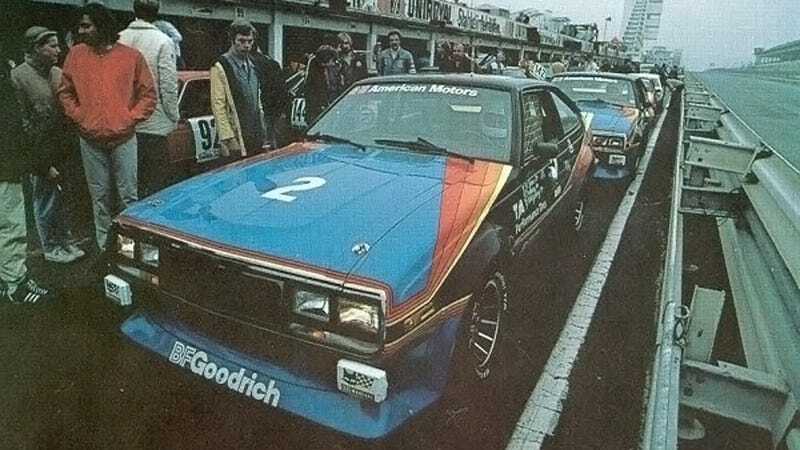 In October 1979, B.F. Goodrich sponsored a pair of AMX's for the FIA Group One 24 hour endurance race at the infamous Nurburgring. Against the odds, America claims victory against Europe's finest. This race was meant for midly modified production cars, with their cars equipped with the 5.0L 304 cubic inch V8 in 4 speed transmission trim. BF Goodrich supplied their BFG T/A street tires for the team. For the record, these AMX's were the first American cars to participate in this race. By all means, these cars were massive in size compared to the competition; Doing battle against the smaller sized and lower displacement BMWs, Fords, Opels, VWs, Renaults, and Audis that stacked the field. The AMC's were stock street cars modified in just 3 weeks prior to being sent off for Europe. Without any prior racing on this track and a practice run cut short because of heavy fog, the team managed to qualify the cars in 20th and 21st overall. The team principle are both drivers Amos Johnson and his partner Dennis Shaw. Supporting drivers in the line-up were Jim Downing, actor James Brolin, auto journalist Gary Witzenburg, and Lyn St. James. The #1 car was given the faster track setup with the objective of winning the race for the team. Once the race started, The AMX's weren't nimble in the corners but made up for it in spades in straight line speed with American brute force, V8's howling at full throttle, topping out at 140 mph. The number one car eventually suffered damage with broken front shock absorbers and a slipping clutch. The engine also started to burn oil. The number 2 car fared no better with its driver Wiltzenburg reporting through the radio that the brakes and front shocks were, "all but gone..."
The number 2 car had to pump its brakes to slow down in the race effectively, dragging the front spoiler with it in an attempt to slow the car without affecting its overall speed in the race. After driving 3219 km (about 2000 miles), they finished 1st and second in class and 25th/ 43rd overall. The #1 AMX Nurburgring race car served as a show car for a few months after the race, then went into storage for about 25 year and has only about 4,000 miles (6,400 km) on its odometer. The #2 race car returned to the racing circuit for several years, but has been located and reunited with the original drivers after over 25 years.